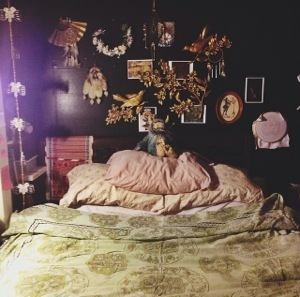 When I moved back home, I resisted the urge to redecorate my childhood bedroom. You’re not going to be here long, I told myself. it’s not worth the effort. Except, my health kind of got all screwy & I ended up staying longer than I ever thought I would, but my bedroom still stayed the same. some kind of cross of a facsimile of how it was when I was growing up & the empty sterility of a cheap hotel room. It got old really quick, especially for someone who nests like it’s a second nature. My homes have always been decorated to the point of near insanity. I veer to the busy & complex, mixed prints & patterns held together by the most tenuous connections. The blank white walls and fluorescent lighting was killing me slowly. & then I found out I had injured my hip & would be spending most of my summer on bed rest. & after surgery in late august, I’d be spending even more time in bed, alone. Something had to be done about my room. So I tore everything apart. I rearranged the furniture & turned an old closet into a bed nook. I lined it with faux leather contact paper & created a canopy with tension rods & an old bed sheet. I found two small bookshelves that fit into the closet & turned them into bedside tables. I started hanging things above my bed. 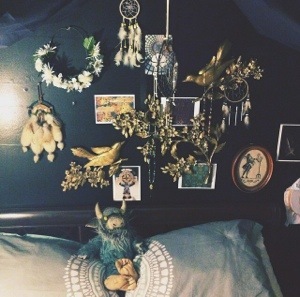 More of my tacky gold decor stuff, pictures I like, dreamcatchers. The pictures above were taken less than two months apart. It’s a constant evolution, it’ll never be finished, there will always be a new layer to add, something that needs to be moved just a little to make the space flow better. My next project is to add a long fringe to the canopy, and maybe string up some fairy lights. Posted on November 3, 2014 November 3, 2014 by nora temple	This entry was posted in decor, dwellings and tagged bedroom, beds, decor, decorating, home, interiors. Bookmark the permalink.